Another 10 days in the journey since we last updated everyone. I rang Matthew this afternoon to check up on him. He had had a good day, thanks to the visit from Rob and Marty (thanks!) and at the time of the call, he was slowly tapping out responses to emails on his iPad. Matthew now has a person email address renovatingmatthew@hotmail.com. With his iPad set up and his stylus hooked up to his arm, he can read and respond to emails. He has said it was pretty slow, so I have told him I will pop in tomorrow night and he can dictate for me….just this once…as the number of lovely emails from all his work colleagues has been quite big. Once he has caught up, he is on his own. J. So, if you do send him an email and you get a response, it has been very carefully and painstakingly sent. Since we last updated, the kids have returned to school and the rehab process has been continuing. Matthew loves getting into the gym and thanks to his team there, as well as Kim and Jackie, Matthew’s wonderful neighbours who have been helping with stretching and trigger points, the range of motion is increasing in his arms. A big thing given that last week Matthew had the prosthetic consultant meeting to finally discuss and commence the process for arms and legs. It is now in train and we hope that he will be measured up shortly and the construction of his first set will commence shortly. I am looking forward to playing chess with Matthew as he learns to us his new ‘tools’. While I can normally beat him, he might use his hook to claim more time simply to get the one up on me. We aren’t competitive. At all. 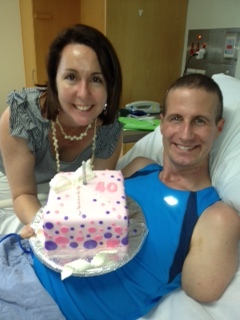 Last Wednesday was also a very special day as Diane celebrated her 40th birthday. Surrounded by flowers, a cake and kids looked after for the night, Matthew and Diane went on a date to Cove at Southbank and had a lovely evening, and Diane was able to stay up at the rehab for once. Not quite as anyone would have planned, but incredibly happy to be together. Have attached a photo of the two of them before they went out to dinner. Matthew is now going home every weekend. The modifications to the downstairs have been done so Matthew can now stay downstairs – the lift will take some time so until then, the family have located ‘dorms’ set up in the boys rooms as they all sleep together on Saturday nights. Matthew comes home at lunch time on Saturday and returns home Sunday afternoon. It has been amazingly wonderful, although incredibly bittersweet at the same time. Reality is hard for the best of us, but pretty complex for the new world they are in. Matthew did acknowledge that he could understand how “someone not in the right frame of mind would focus on all the bad stuff”. He did go on to say “Lucky I am not like that”. Neither is Diane and seeing them on Sunday afternoon, very weary but still smiling was very humbling. In the meantime, the kids are playing happily in the background. Each return home will bring some more challenges, but it would appear that they can do this together. So, the real focus for the next few weeks and months are arms and legs. We are so looking forward to that thrill of picking something up for the first time. – Origin have set up a fund for all Origin staff and have been amazingly supportive of Matthew and the family. – The family is in the process of establishing a tax deductible fund for ‘renovatingmatthew’. We anticipate this will be finalised by the end of November/early December. – Any funds raised will assist in finding the best available technology for limbs and modifications. – For events and activities outside of the Origin effort, we are likely to put these on hold until late January when we feel Matthew will be in a good place physically to be able to actively participate and engage after a few more months of rehabilitation. We will keep everyone updated on this as we progress with this!